Looking for a rewarding career pathway in the healthcare industry? Look no further than becoming a licensed practical nurse (LPN) in Arkansas. With the Bureau of Labor Statistics (BLS) predicting a 12% increase in LPN employment through 2026, there’s never been a better time to enroll in an LPN program. Arkansas LPNs earn around an hourly wage of $17.49 or annual salary of $36,370, which is roughly $7,660 less per year than national average. Are you looking to become a licensed practical nurse in Arkansas? The school you choose is important when it comes to getting your license. Approved programs in Arkansas are offered at community colleges, technical centers, and private career schools - we list 26 schools across the state. After careful review of NCLEX-PN exam first-time pass rates over the past several years, we have ranked the top 10 programs. 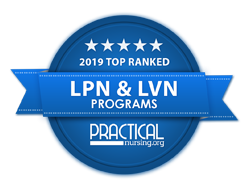 For more information on our LPN program rankings, see our Methodology page. To see all the top ranked LPN programs in Arkansas click here. Choosing the right school and LPN program can be daunting. To ensure that you are choosing wisely, you should check to see if your school of choice is properly accredited. The Accreditation Commission for Education in Nursing is a national accrediting organization to look out for, but there are other regional accrediting bodies as well. It’s also a good idea to ensure that the school and program are endorsed by the Arkansas State Board of Nursing. Arkansas LPN program costs can vary due to type of school, location, and other factors. Students should plan to cover the cost of tuition, mandatory fees, course materials such as textbooks, and room/board if applicable. As an example, the LPN program at Northwest Technical Institute in Springdale has a total cost of under $10,000. Most schools have financial aid departments and programs that can help students with these expenses. Official transcript from state-approved nursing program with degree received (must come directly from school). Verification of graduation date (done by the director of graduated nursing program via secure electronic process). Graduated from an approved nursing school equivalent to Arkansas. Licensed or eligible to be licensed as an LPN in another country. Passed all required licensure examinations. Arkansas LPN licenses expire every 2 years on the licensee’s birthday. The NCLEX-PN exam must be passed by LPN program graduates in order to become licensed. The exam consists of between 85 and 205 questions covering different aspects of nursing knowledge. You can learn more about the NCLEX-PN exam here, and even take our NCLEX-PN practice exam to hone your skills before you take the real thing. Proof of having passed the NCLEX. Proof of state licensure in another state. Proof of employment as an LPN in another state. The table below lists career information obtained from the Bureau of Labor Statistics for licensed practical nurses in Arkansas. The table is sorted by total employment, with the largest metropolitan areas listed first. For those interested in advancing their nursing career, see our Arkansas LPN to RN/BSN programs page. University of Arkansas at Monticello - College of Technology - McGehee's Practical Nursing program is one of the best ways to begin a fulfilling career in the field. After a year of study, students will be qualified to sit for the NCLEX-PN. Once students have passed this exam, they can go right to work as an LPN in a hospital, nursing home, doctor’s office, or other facility. Phillips Community College of the University of Arkansas (PCCUA) is located in DeWitt, Arkansas, with additional campuses in Helena and Stuttgart. PCCUA-DeWitt campus offers associate's degrees, technical certificates, transfer programs, community education programs, business training, and computer workshops. With the inclusion of the technology and training center, students can acquire hands-on training for their field of choice. Black River Technical College is located in Pocahontas, Arkansas, with an additional campus located in Paragould. By blending tradition, technology, and innovation, Black River Technical College emphasizes quality in their practical nursing program and workforce training. They also believe that nurturing relationships increases access, leading to seamless education. Arkansas Northeastern College is located in Blytheville, Arkansas, with centers also located in Burdette, Leachville, Osceola, and Paragould. Arkansas Northeastern College is not only committed to providing accessible, quality practical nursing education programs and services for lifelong learning opportunities for it students, but it's also committed to the idea of worth and dignity in individuals. Northwest Technical Institute (NTI) is located in Springdale, Arkansas, providing quality education and preparing students for practical nursing jobs currently in demand in northwest Arkansas. NTI assists students in developing technical skills that are in high demand, helping them advance in the workplace. University of Arkansas Community College at Morrilton (UACCM) is approximately 50 miles west of Little Rock, Arkansas, in the town of Morrilton. By offering affordable tuition, small class sizes, dedicated faculty and staff, hands-on training, and career transfer services, UACCM helps to ensure collegiate and professional success in the practical nursing realm. Arkansas State University-Beebe is two-year school that operates separately from the Arkansas State University (ASU) System. ASU-Beebe located in Beebe, Arkansas, with additional campuses in Heber Springs, Searcy, and Little Rock Air Force Base. With high-quality programs and reasonable pricing, students can work today on becoming a practical nurse, with the option to move forward to an associate's or bachelor's in nursing later on. The University of Arkansas-Fort Smith and Western Arkansas Technical Center (UAFS/WATC) have teamed up to offer students in the state a quality PN program. Their goal is to add caring practical nurses to the western Arkansas workforce through rigorous academic instruction and valuable clinical experiences. North Arkansas College (Northark) is a public, two-year school located in Harrison, Arkansas. Northark offers a variety of educational opportunities including transfer and technical degree programs, one-year technical certificates, customized business training, GED classes, and community education courses. With a commitment to learning, Northark's practical nursing program seeks to offer affordable, quality nursing education to enrich the community. Arkansas Tech University's Ozark campus accepts students to their practical nursing program in August and January each year. ATU Ozark's curriculum theory centers on holistic patient care, taking physical, emotional, spiritual, and social well-being into account. They also offer an Associate of Applied Science in Allied Health with a PN exit option. Can I Become an LPN If I Have a Criminal Record?